Posted on October 28, 2014	by Katy K.
In 1799, the world came apart and then back together quite differently. Since the Great Disruption, times as well as countries are different. Mapmakers who can figure out where things are and what kind of culture exists there are highly in demand. 12-year-old Sophia Tims, whose parents left to go exploring years ago and never returns, lives in Boston with her Uncle Shadrack, the most famous mapmaker in all of New Occident. He’s just begun to teach her about some of the more esoteric forms of mapmaking, maps that can hold memories of weather, places, and people. But as Boston politics cause havoc even there, Sophia comes home one day to find that her uncle has been kidnapped and their secret map room ransacked. 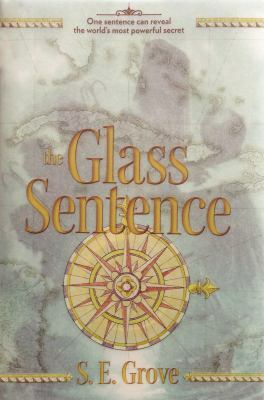 She and Theo, a boy from the land to the south, try to follow Shadrack’s instructions to take his most precious glass map to safety in the Baldlands, Theo’s native lands. They are closely followed by the truly creepy bad guys – the Sandmen – and even when they get to the Baldlands, all is not as they hope. This is a long fantasy book heavy on the world-building. I was captivated by the ideas about juxtaposed times and trying to navigate between different eras. The characters were straightforward – I found Sophia sympathetic enough, loved the pirate queen Calixta, and kept getting annoyed at Theo for being unreliable and then getting upset at Sophia for not trusting him. They just met – why should she trust him? If you’re not the type to get bored by lots of world-building (I wasn’t, but many other people have been), there is a lot of exciting action in interesting places between these scenes. I just ended up with the feeling that the characters were running around for no good reason. Sure, they’re trying to save the world, but neither the peril nor the solution quite made sense to me. This is nominated for the Cybils in the middle grade speculative fiction category, but shelved in teen at my library. There’s no romance and a low body count, but some disturbing torture scenes. This is a great book for people who love maps and detailed fantasy worlds with intriguing ideas behind them, though not one I’d hand to just anyone who came to the library looking for a fantasy book. This entry was posted in Books and tagged historical fantasy, maps, teen fantasy, youth fantasy. Bookmark the permalink.